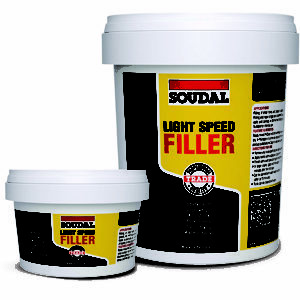 Soudal Australia recently launched its new Light Speed Filler, a high quality, rapid drying, lightweight filler. The Light Speed Filler is specifically designed not to shrink and may be used for filling and sealing pinholes, drill holes, gaps and cracks in walls and ceilings that are made from timber, plaster, drywall panels, concrete, brick and other porous materials. Soudal’s high speed filler is also suitable for internal and external use, on surfaces that will be painted after they are filled. Once Light Speed Filler is applied, it provides a super smooth finish that has good adhesion on many porous materials. It can be sanded after cure and is paintable 15 minutes from application (depending on the amount used). Light Speed Filler usage ranges from repair and filling of small holes, cracks in walls and ceilings, filling static joints and shrink free finishing of seams of synthetic finishing and decorative profiles. It is available in 250ml and 900ml ready mixed plastic pot with 12 months shelf life.